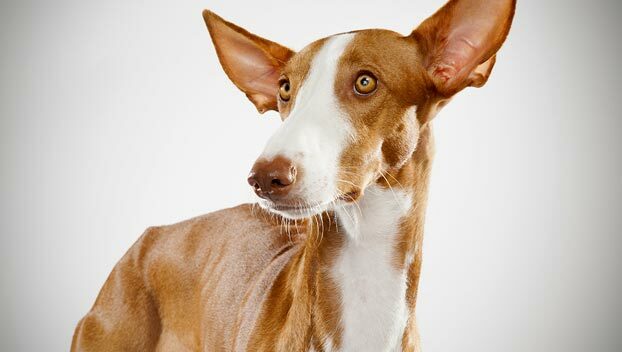 A rare breed due to their striking looks, this dog has roots as far back as the Egyptian Pharaoh Hound. Moving from Egypt to Spain, this breed is able to handle heat due to its ancestor's island life. In Spain, the dog learned to be a great hunter of rabbits. Trained to retrieve the animal and bring it back to its owner, he enjoys working and pleasing his master. 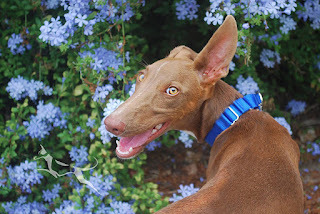 The Ibizan Hound, also at times in its development known as the Ibizan Warren Hound, the Ibizan Podenco, the Podenco Ibiceno, the Podenco Mallorquin, the Ivicene, the Balearic Hound, the Balearic Dog, the Balearen-Laufhund and the Galgo Hound, is an ancient breed with an exotic and highly distinctive appearance. When it spread to the Catalonia region of the Spanish mainland, it was called Ca Eivissenc or Ca Eibisenc. When it reached the south of France, it was called the Charnique, Charnihue, Charnegue, Charneque and Chien de Baleares, although the breed eventually was banned from France due to its association with poachers. It also has been called the Anubis - the “Watchdog of the Dead” - in part because a full-sized statue identical to the Ibizan Hound of today was found inside the tomb of King Tutankhamen when it was discovered in 1922. 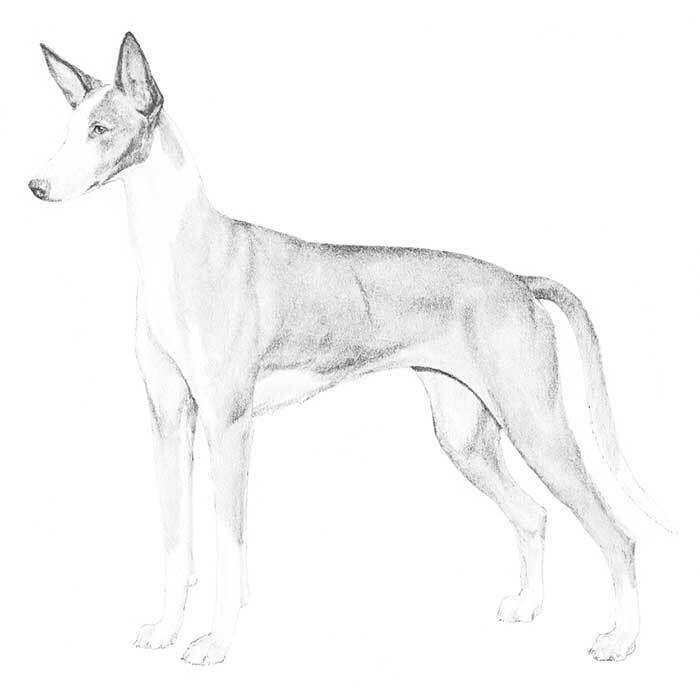 The affectionate nick-name for the breed is “Beezer.” An interesting historical footnote is that according to legend, Hannibal was born on Ibiza and carried Ibizan Hounds with him on his elephants when he invaded Italy. Ibizan Hounds do well in apartments if they are properly exercised. They must be kept on leash whenever they are not in a securely fenced area. Beezers have a strong prey drive and will pursue moving objects heedless of your commands. Ibizan Hounds are excellent jumpers. It takes at least a 6-foot fence to confine them to a yard. Underground electronic fences are not recommended for this breed. Beezers need daily exercise. If their exercise requirements are not met, they can become bored and destructive. Male Ibizan Hounds may develop poor appetites when they are adolescents. Encourage them to eat, but don't go overboard with food bribes, elaborate meals, or hand feeding; you'll simply end up with a picky eater. Beezers become cold easily. If you live in a cold or wet climate, purchase a coat for your dog. Ibizan Hounds are excellent with children, but all dogs should be supervised when they are with young children. These dogs are generally quiet indoors and can become couch potatoes but they need a daily walk or run. Ibizan Hounds are expert counter surfers so don't leave food out, even if you think it's out of your dog's reach. Ibizan Hounds are generally not aggressive but they do have a high prey drive and are not best suited for homes with small animals. They can learn to get along with cats if they're raised with them, but outdoor cats and other animals are fair game. Ibizan Hounds are a rare breed. Expect to spend time on a waiting list if you're interested in one of these dogs. The Ibizan Hound has a long, narrow head; large pointed ears that are highly mobile; clear amber eyes; and a long tail. The Ibizan comes in two coat types - shorthaired and wirehaired - but the shorthaired variety is most common. The wirehaired Ibizan has a bushy mustache. The coat can be white or red, with the red ranging from a light yellowish-tint known as lion to a deep tone. The dog can be a solid color or a mixture of white and red. 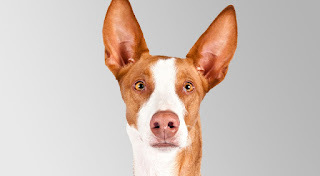 For a long time it was thought that the Ibizan Hound was an ancient breed, but the advent of DNA studies has shown that he’s a much more recent creation. He comes from the Spanish island of Ibiza where he’s popular as a rabbit hunter. In Spain, Ibizans often hunt in tandem with ferrets, nabbing the rabbit after the ferret flushes him from his den. 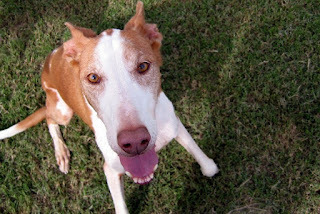 The Ibizan Hound was first introduced to the United States in 1956 by Colonel and Mrs. Consuelo Seoane. The American Kennel Club recognized the breed in 1979. Today the Ibizan is a well-kept secret, ranking 151st among the dogs registered by the AKC. Television viewers got an eyeful of the breed in 2003 and 2004 when Ch. Luxor’s Playmate of the Year (nicknamed Bunny) won the Hound Group at the Westminster Kennel Club show. The lively Ibizan is attracted by anything that moves and will run after cats, rabbits, or anything else that looks like it might be fun to chase. His large, mobile ears are indicative of his super sense of hearing, which makes him an excellent watchdog. He might not bark an alarm, but if you see those ears twitching, you'll know something or someone is around. With his family, the Ibizan is even-tempered, affectionate, and loyal. He may be reserved at first with strangers, but he should never be shy or aggressive. Like every dog, Ibizan Hounds need early socialization — exposure to many different people, sights, sounds, and experiences — when they're young. 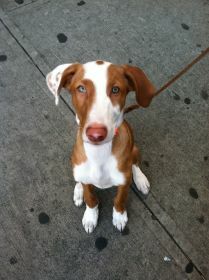 Socialization helps ensure that your Ibizan puppy grows up to be a well-rounded dog. Enrolling him in a puppy kindergarten class is a great start. Inviting visitors over regularly, and taking him to busy parks, stores that allow dogs, and on leisurely strolls to meet neighbors will also help him polish his social skills. Given soft bedding and warm shelter, the Ibizan can stay outdoors in cold climates, but it is not usually kept as an outdoor dog. As the hound is a skillful jumper, care should be taken when constructing an enclosure. The dog’s smooth coat needs just occasional brushing but the wire coat has to be brushed every week. 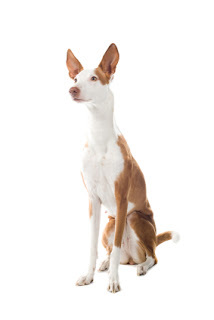 The athletic and independent Ibizan Hound should be given regular exercise in a safe and enclosed area. Good exercise enables the hound to stretch its body, but its requirements are also satiated through jogs on a leash, long walks and full running. 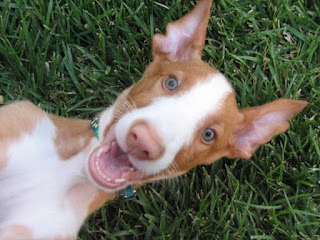 The Ibizan Hound will do okay in an apartment if it is sufficiently exercised. It is moderately active indoors and will do best with at least a large yard. The Ibizan Hound can jump very high from a complete standstill, enabling him to easily jump most fences. An incredibly fast dog, the Ibizan Hound can be extremely difficult to recapture. This breed is a sighthound, meaning it hunts by sight rather than scent. Ibizans have selective hearing and an independent nature. They will take off running and WILL NOT return until they feel like it. The strong chase instinct and lack of caution in traffic can lead to disaster. The breed is quite sensitive to cold, as his coat is not very protective. Ibizan Hounds are docile animals who should be treated gently at all times. Gentle consistency, lots of praise and treats, and and extra helping of patience are required for training. Beezers are independent animals and don't particularly have a need to please people. Their attitude toward training is, “What's in it for me?” You need to give them a reason to listen to you. Beezers can be wary of strangers which can lead to excessive shyness or fearfulness, if left unchecked. Early and frequent socialization is required to teach the dog to accept new people and new situations are welcome. Though Beezers need time to gallop every week, you don't need to be a runner yourself to raise this breed, in fact even the fastest sprinters can't keep up with an Ibizan Hound. They should be taken to a dog park or better yet, enrolled in a dog club with a lure-training track where your Beezer can chase a mechanical lure at top speed. Other than their weekly runs, Ibizan Hounds are content with several walks per day to stay fit. They are fine city dwellers, as long as they are allowed to get to a park for regular sprints. Their size makes them unsuitable for small apartments, but they are graceful dogs who don't need excessive room to move around indoors, so large apartments or condos are ok spaces. Both shorthaired and wirehaired Ibizan Hounds are easy to groom. They require weekly brushing to remove loose and dead hair and maintain coat sheen. Bathe only as needed. Ibizans are naturally clean dogs, which makes baths only necessary once every few weeks. Check the ears on a regular basis for signs of wax buildup, irritation or infection. Clean the ears with a cotton ball and a veterinarian-approved cleanser; never use a cotton swab in a dog's ear canal. Teeth should be brushed on a weekly basis to prevent tartar buildup, promote gum health and keep bad breath at bay. Trim nails monthly if the dog does not wear the toenails down naturally outdoors. Because they're so playful and silly, Ibizans are good with children. They can be gentle but may chase young children who are running around. They're probably best suited to homes with older children who understand how to interact with dogs. Ibizans enjoy the company of other dogs and can learn to get along with cats, if they're introduced at an early age. Your housecat will fare best with an Ibizan if he's the type to stand his ground rather than run. Cats or other animals that wander into their yard are fair game, however. A breed that believes itself the equal of humans, the Ibizan Hound is in need of a strong and active lifestyle. With a knack for jumping, he's best in a yard without a gate or fence and not to be kenneled. A good dog with children and in a family, he's affectionate, caring, clean and protective. With an intrinsic ability to hunt, this pup will only do well with cats if raised with one — if not, he'll most likely chase and kill it, as with other small animals and rodents. He'll need to be introduced to strangers with ease, including the human and dog kind. The Ibizan’s resemblance to depictions of the Egyptian dog god Anubis is one of the reasons he is often thought to be an ancient breed. According to journalist Norman Lewis, when an owner no longer wants to own one of these dogs (having too much of an appetite, for instance), it is considered very bad luck to kill the dog. Instead, they release the dog on the other side of the island, so that someone else might 'adopt' the animal. Starting off the day with a walk, this pup will come home to play and cuddle with the kiddos. Watching the house all day will be his No. 1 priority, a close second being to trail the home for rodents. He'll happily run next to you on your bike ride as you peddle away. After lunch and a catnap, he's ready to play again. After dinner and a swim with his favorite person, he'll be happy to sleep next to you while ensuring the home is safe.